Running on Pixie Dust: I'm a Baltimoron! Under Armour Race Premiums - Yes, please! Everyone knows runners can be a little crazy. And those of you who know me, probably know that I love my race bling. So when the time came to sign up for my 2016 racing schedule, I decided to go all out. Those of you who have been following my blog, have seen race recaps from the first two legs of the King Crab Challenge. 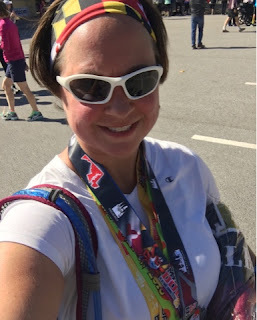 In May, I completed the Nut Job Challenge at the Frederick Running Festival which included a 5K on Saturday night and a half-marathon on Sunday morning. 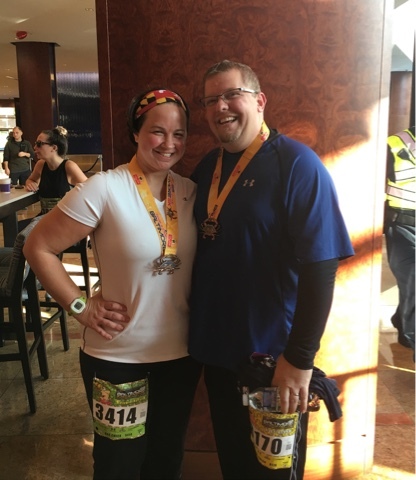 Just 3 weeks later, I ran the hot, hilly, and humid Baltimore 10 miler. 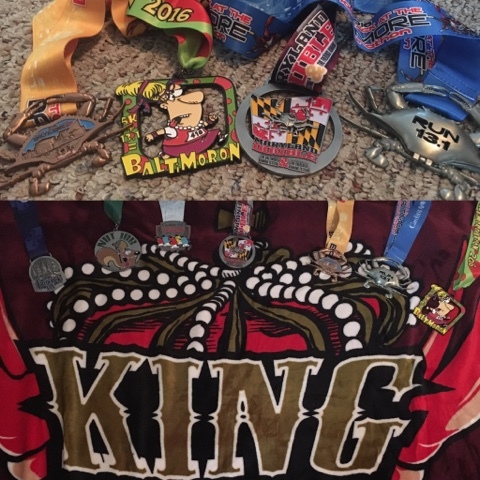 The final part of the King Crab Challenge came with completing the Baltimore half-marathon last weekend. 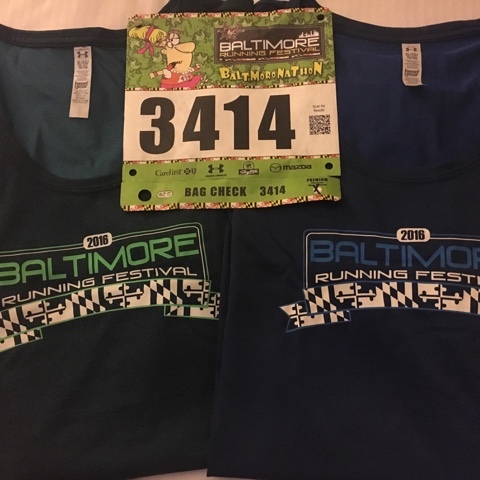 I decided to take the Baltimore Running Festival one step further and signed up for the Baltimoronathon - a 5K and a half-marathon with start times just two hours apart. I was excited to have my husband join me for this race weekend. We decided to get a hotel room in the city the night before so that we wouldn't have to get too early of a start on Saturday morning. Our hotel, the Hilton Baltimore Inner Harbor, happened to be just a few steps from the start line for the 5K - perfect! Just a few days before the race, I convinced my husband to sign up for the 5K as well. After a light breakfast of oatmeal and a banana, we headed down to the start line for a 7:30AM start. Since I knew I was tackling two races in the same day, I decided to take it easy on the 5K and walked most of it with my husband. The 5K course is almost entirely uphill the first half and then turns around to go downhill the second half. We added some jogging in to the second half of the race, which helped to loosen me up for the half. We finished the 5K in about 47 minutes, collected our bling, and headed back to the Hilton lobby to meet up with my friends who were going to be running the half. The half was slated to start at 9:45AM, so we started heading down to Inner Harbor for the start around 9:15. The Baltimore Running Festival also features a marathon that day. Along the way to the start, we were able to cheer for the marathon runners passing by and were keeping a look out for a friend who was completing the full. The start of the half is right next to the Inner Harbor and features self-seeded waves. My speedier friends headed off in Wave 2 and I lingered back to the end of Wave 3 of 5. I don't know why, especially after the Baltimore 10 miler, but I was surprised how hilly the course was - particularly the opening miles. Despite the hills, I felt really good the 5-6 miles. It typically takes me a few miles to hit my groove on a long run, but I think the 5K earlier took care of that for me. Around mile 7 the course flattened out and circled Lake Montebello where a DJ kept runners dancing and smiling as they entered and left the lake. The Lake Montebello portion and 33rd Street, mirrored a few miles of the Baltimore 10 miler. However, while that race ended with a large uphill portion back into Druid Hill Park, the Baltimore Half Marathon finished with a downhill run to finish through Eutaw Street and Oriole Park at Camden Yards. I'm really glad the race finished downhill, because by about mile 11, I was dragging and needed all the help I could get. I finished the race with a smile and collected my bling! 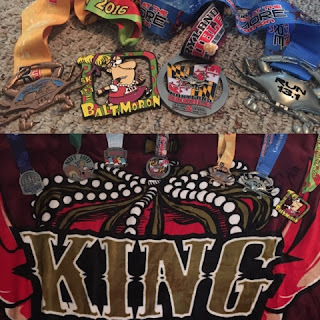 That day, I earned my 5K, half-marathon, and Baltimoronathon medals. I also was able to collect my Maryland Double medal for finishing the Frederick and Baltimore Half Marathons. And the King Crab Challenge award this year was a fleece blanket. My training had been a little lax for this half, so my goal was to finish in under 3 hours, and I clocked in at 2:57. The spoils from my 2016 race season! So for those of you thinking about the Baltimore Running Festival - I would definitely recommend it! The race is well supported - both officially by Corrigan and unofficially by the people of Baltimore. The residents and spectators who come out to cheer runners along the course offered high fives, music, costumes and some pretty funny signs. The Baltimoronathon was certainly an added unique challenge. 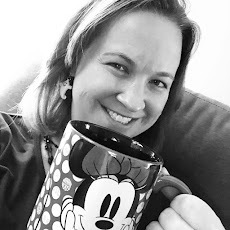 Now it's on to the next race - runDisney's Wine and Dine 10K on November 5th! Way to go! Super cool experience. I need to get back into running more. Thanks! I still consider myself to be getting back into running following the birth of my second child in February 2015. I'm not fast, but challenges and fun races keep me motivated to stay active! Good luck! !